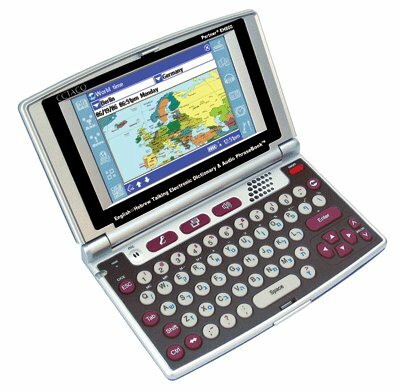 expandable bilingual Dictionary and Travel Audio Phrase Book. With cool modern styling, hi-resolution color touch-display and state-of-the-art linguistic tools it is one of a kind. The massive vocabulary contains over 510,000 words and is one of the biggest around. The inclusion of the most sophisticated and accurate voice capabilities available on today’s competitive market is the defining feature of this remarkable handheld. It features both state-of-the-art English speech recognition and highly advanced English and Hebrew voice synthesis powered by the latest TTS (Text-to-Speech) technology. It even goes so far as to include crystal-clear native-speaker voices for both languages in the Audio Travel Phrase Book section as recorded by professionals. Expandable vocabulary: over 510,000 words already included in the general dictionary - the largest vocabulary base ever! Plus you can easily add more than 50 language combinations available as ECTACO MMC Cards! Advanced English and Hebrew speech synthesis. Designed with the real traveler in mind, the Audio PhraseBook is at your disposal on pleasure or business trips. It delivers real human-voice output in English and Hebrew for over 14,000 pre-recorded phrases. It also provides the different responses you might receive in the "You May Hear" section.